Although it may seem like PonyBoy Press has become some sort of Valentine blog, I assure you it has not - but, it does seem clear that I have gotten a bit swept away with the upcoming holiday. 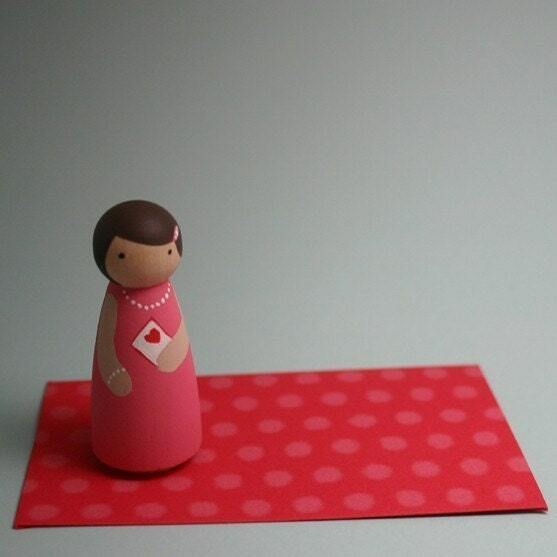 This little wooden doll is a cute valentine, especially if you were the one giving it and you were a girl with short brown hair. In general I am in favor of the recent little wooden doll trend. I've always liked them. I also like some of the neat traditional German ones. I wish I had the skills to paint my own, but I am not that good at it. If you have those skills, however, there are plenty of places on Etsy to get the blank wood forms, including the shop nakedpeggies who sells the Valentine Peggy shown here and also goosegrease. It makes a unique gift. And speaking of gifts, the Valentines posts are not over. I am working on something that hopefully will work out. Stay tuned! I always get more excited about Valentines Day then I expect I will. I just love the giving of cards and the making things pretty just for the sake of doing it. I suddenly want to make some Valentines things for my shop, but I don't know if I will get to it in time. It always comes so fast! 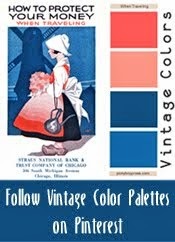 Here are some faves I have been visiting on Etsy. Hope you find some in here you like. Well, looks like some great minds were thinking alike recently because Creature Comforts designed this free template for you to create a valentines tea bag wrapper and tag. Very nice! I love this idea from Martha Stewart. Such a simple and cute idea. 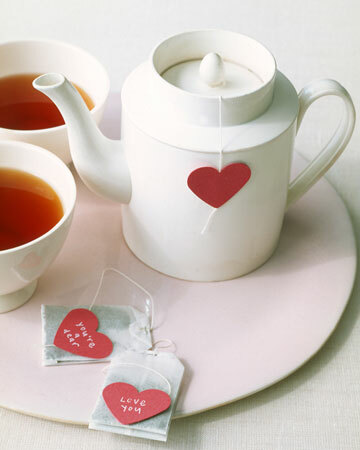 You could send a valentine and a a favorite tea to a friend in the mail or you could have your own Valentine tea party and make these for it. Speaking of tea, I updated my Flickr account to Pro recently and I am actually using it now. I created a set with just images of my little tea parties I like to do. You can see it here. Oh, how I would love to have a space like this. All my stuff would look like this if I had the space. Right now I feel overwhelmed with too much stuff in my craft room/office/record library, but really I have a normal amount of stuff, I just have too small a room. This bookcase was just built by the talented duo from Something is Hiding Here. I have been looking at the new White House website (wish I had looked at it before today so I could compare). It looks great and it was neat to see that there is a White House blog now. 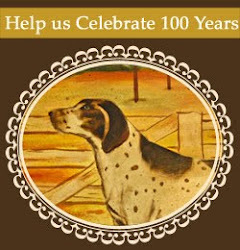 I decided to take the plunge and do a blog just for my vintage photo and ephemera collection. 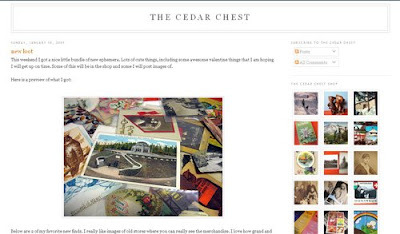 It will be a blog for the Cedar Chest store as well. Please take a look and subscribe if it interests you. I have lots of things I am excited to share. I am not sure what I have been doing, but it is nothing of note. 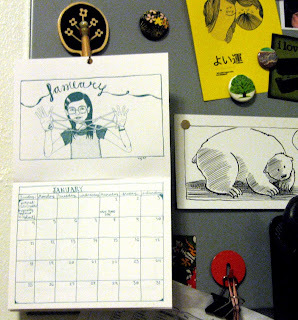 I just now put up the new Invisible Summer calendar for 2009. I guess I am trying to get it together, but it feels difficult. I can tell you some things I have been doing. I have been watching a lot of British TV, including re-watching all my French and Saunders dvds. I watched one hideous movie called Mamma Mia and I have been listening to Coconut Records. I keep threatening the craft den that I am going to clean it up, but so far I haven't. It is nice not to have deadlines for a while. We woke up to a bit of snow this morning. A New Years snow is supposed to be lucky, but does that count if it's on the 2nd day? My family and I celebrated Christmas on New Years Eve and New Years Day, so you are going to get some belated after Christmas posts from me. 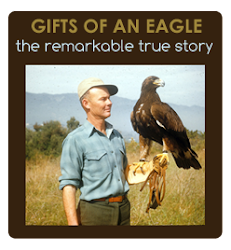 But, first I want to share with you my after Christmas deal that I am so pleased with. I got these dessert plates half off at New Seasons (a local grocery chain that has the best gift items). I am so smitten with them and think they could be good for year round. Although my living/dining decor is more towards brown, burgundy and rust. I am think I may need to eventually get some placemats and plates that complement these. I found them online here.